try to open them outlook forces you to save them. example) OR put your files in something else like a 7-Zip or WinZIP file and send them. want to disable the feature completely read on…..
2. On the Tools > Options. box under Virus Protection, and then click OK. NOTE for each version of Outlook, the number in the registry path is different. 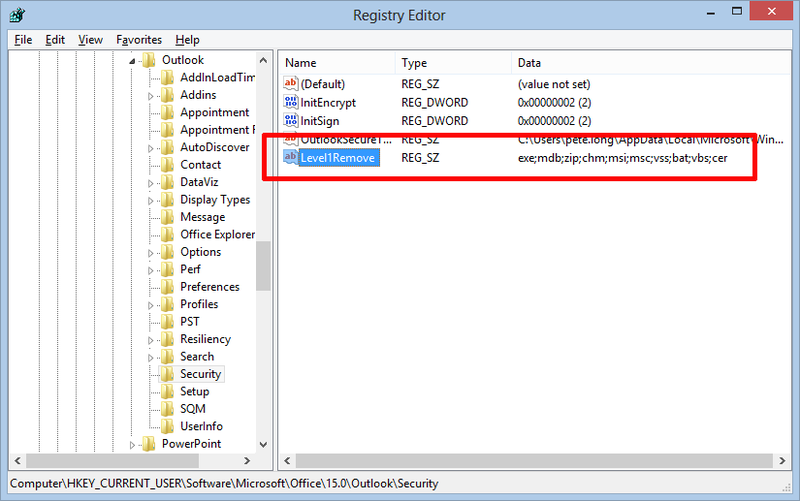 In NEWER Versions of Outlook you will need to manually create the Security key. click in the right Pane and select New > String Value. and MS Access Databases. Double click the Level1Remove string you just created. separate each with a colon (no spaces). you are done, click OK and close the registry editor.